Detroit’s Water War: a tap shut-off that could impact 300,000 people » Cancel Detroit’s Debt To The Banks! A right-wing state and corporate push to cut off water is economic shock therapy at its most ruthless and racist, but resistance is growing. It was six in the morning when city contractors showed up unannounced at Charity Hicks’ house. Since spring, up to 3000 Detroit households per week have been getting their water shut-off – for owing as little as $150 or two months in bills. Now it was the turn of Charity’s block – and the contractor wouldn’t stand to wait an hour for her pregnant neighbour to fill up some jugs. “Where’s your water termination notice?” Charity demanded, after staggering to the contractor’s truck. A widely-respected African-American community leader, she has been at the forefront of campaigns to ensure Detroiters’ right to public, accessible water. The contractor’s answer was to drive away, knocking Charity over and injuring her leg. Two white policemen soon arrived – not to take her report, but to arrest her. Mocking Charity for questioning the water shut-offs, they brought her to jail, where she spent two days before being released without charge. Welcome to Detroit’s water war – in which upward of 150,000 customers, late on bills that have increased 119 percent in the last decade, are now threatened with shut-offs. Local activists estimate this could impact nearly half of Detroit’s mostly poor and black population – between 200,000 and 300,000 people. “There are people who can’t cook, can’t clean, people coming off surgery who can’t wash. This is an affront to human dignity,” Charity said in an interview with Kate Levy. To make matters worse, children risk being taken by welfare authorities from any home without running water. Denying water to thousands, as a sweltering summer approaches, might be bad enough in itself. But these shut-offs are no mere exercise in cost-recovery. The official rationale for the water shut-downs – the Detroit Water Department’s need to recoup millions – collapses on inspection. Detroit’s high-end golf club, the Red Wing’s hockey arena, the Ford football stadium, and more than half of the city’s commercial and industrial users are also owing – a sum totalling $30 million. But no contractors have showed up on their doorstep. 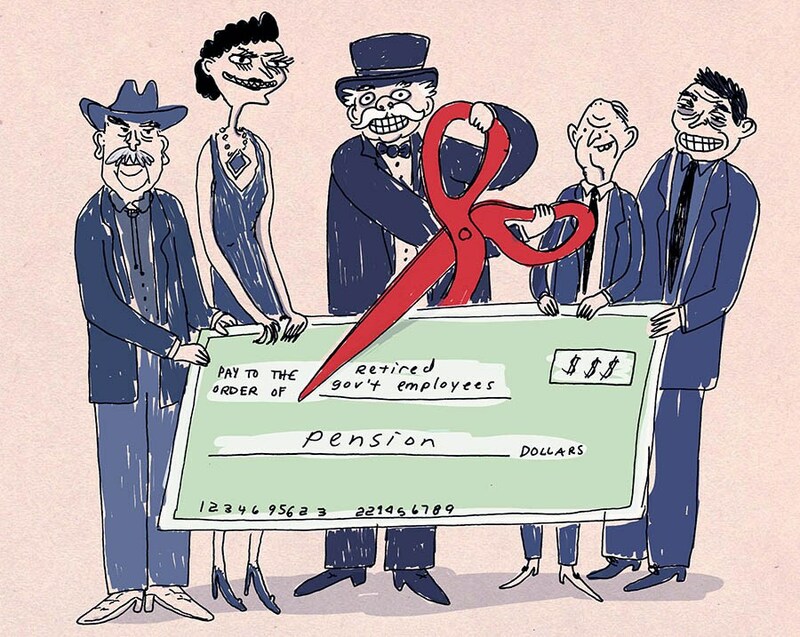 The targetting of Detroit families is about something else. It is a ruthless case of the shock doctrine – the exploitation of natural or unnatural shocks of crisis to push through pro-corporate policies that couldn’t happen in any other circumstance. The first shock was the slow disaster that struck Detroit over the last four decades: the flight of corporations toward cheaper, overseas labour; the movement of white, wealthier Detroiters to the suburbs, draining the city’s tax base; a Wall Street-driven financial crisis that left many homeless or jobless; and the deliberate starving of the city of funds owed them by the Republican state legislature. On its heels has come a round of economic shock therapy: taking advantage of the severe decline in revenue from Detroit’s first shock, the media, corporations and right-wing politicians drummed up a crisis of fear about financial debt. This has become the pretext for a rapid-fire assault on Detroit’s public resources: an attempt to dismantle its schools, to slash its pensions, and to transfer its parks and art and land into the hands of private corporations. The public water system, a prized resource worth billions and sitting on the Great Lakes, is now the latest target – and the water shut-offs are a way to make the balance-sheet more attractive in the lead up to its privatization. As Detroiters like Charity Hicks have taken a stand, they have been met by a third shock: literal blows of police force and violence, intended to dampen any resistance. Taking full advantage of Detroit’s plight required the removal of another obstacle: democracy. No Detroit politician, subject to the pressures of an electorate, could imagine going after the city’s water. But in 2013, using Detroit’s debt as his excuse, Michigan’s Republican governor Rick Synder imposed an “emergency manger” – a trustee to govern Detroit unilaterally. When Detroiters overwhelmingly voted in a referendum against the “emergency manager” law, Synder passed a new one overnight – with a provision rendering referendums meaningless. 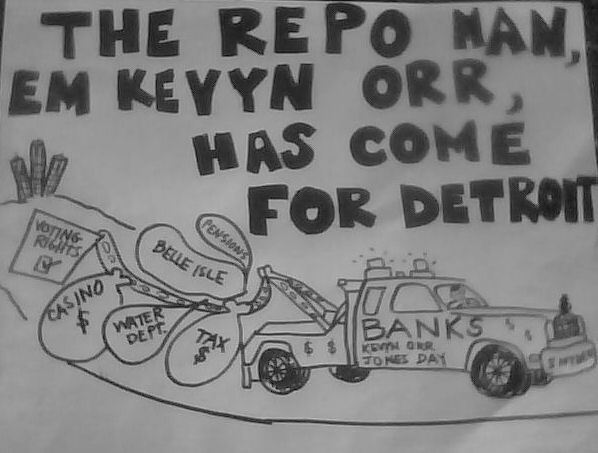 Having made his reign democracy-proof, Detroit’s emergency manager has proceeded to drive the city toward bankruptcy. With the bankruptcy dominating media headlines across the country, the real nature of Detroit’s crisis has been obscured and ignored. It has left the banks and corporations free to pursue a liquidation of the city’s assets. And nothing is off the table. There is one other way the situation in Detroit would never have come to pass: if this was a city predominantly of white people instead of black. Too much of America views Detroit like the policemen viewed Charity – as deviant, inferior and beyond repair. This racism has meant decades of block-busting, red-lining, police brutality and the legislative punishment of the city. And it has done something more insidious: it has written off the people of Detroit. “Every day, we’re shown that black lives, black quality of life, black communities, don’t matter,” says Charity. The view the judge would see is in radical contrast to Detroit’s prevailing image: a city with a flowering network of community gardens, more than any in the United States, feeding residents and nurturing solidarity; a rich artistic and musical culture; and neighbourhoods organizing for meaningful education and to restore local democracy. No one denies Detroit is racked by crime, poverty and unemployment – but it is also hard to miss its vibrant renewal. It is from this incredible web that a challenge to the water shut-offs is emerging. Community organizations have filed a human rights complaint to the United Nations, demanding Michigan state impose a moratorium on the shut-offs. UN experts have already responded critically. There are daily acts of civil disobedience: cars being parked over water valves to prevent shut-offs; neighbours teaching each other to turn the water back on. A new initiative called the Detroit Water Brigade – an Occupy Sandy-style response to disaster zones created by the deprivation of water instead of its excess – is accepting supplies from around the country, opening local service hubs, and coordinating calls to action. And the Detroit People’s Water Board, a broad coalition co-founded by Charity Hicks, continues its work of raising consciousness about water justice and conservation, setting out a vision for water as a public trust, not a commodity – a source of life, not of private enrichment.